I love chocolate covered straweberries. I love cupcakes. This. Makes. Sense. What doesn’t make sense though, is how I managed to totally screw up the frosting I intended to use. I had to work some magic and ended up using my faulty frosting as a filling for these bad boys. It ended up making the cupcakes sooooo moist, and the actual frosting I used ended up being sooo much more Strawberry than the original. I win! I used the Chocolate Cupcake recipe from this post. 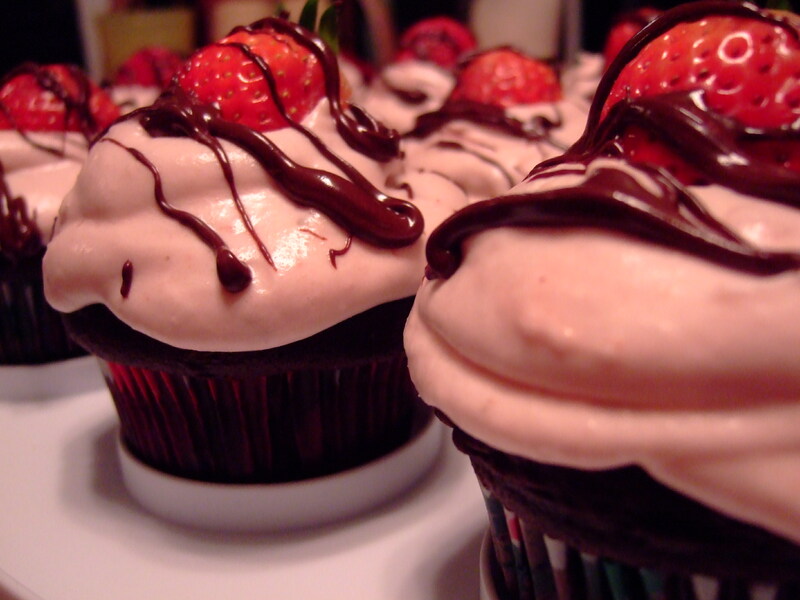 For the frosting, give this recipe a try from My Baking Addiction. It’s what I ended up using for the filling. I think I was trying to alter it too much by adding more strawberry puree than it called for, and then my over-mixing caused it to separate. Definitely delicious though! 🙂 You’ve stolen my heart with these cupcakes! They’re beautiful!